The Hybrid display is a modular design that utilizes an aluminum extrusion framework that locks together. The top canopy is made from ¾” plywood and laminated in with black PVC (or your choice of many colors for a small up charge). The canopy comes with down lights and connects to the aluminum framework with Thumb screws. The only tool you will need is an Allen Key (provided). The framework stands on laminated plywood feet that are secured with thumb screws from the bottom side. A fabric graphic (included) is stretched between the aluminum extrusions. The Acrylic wings attach with connectors to the Aluminum extrusion exhibit. Scroll to see a 10 x 20 version of this display, a picture of the rolling case and an optional kiosk (kiosk and monitor sold separately). 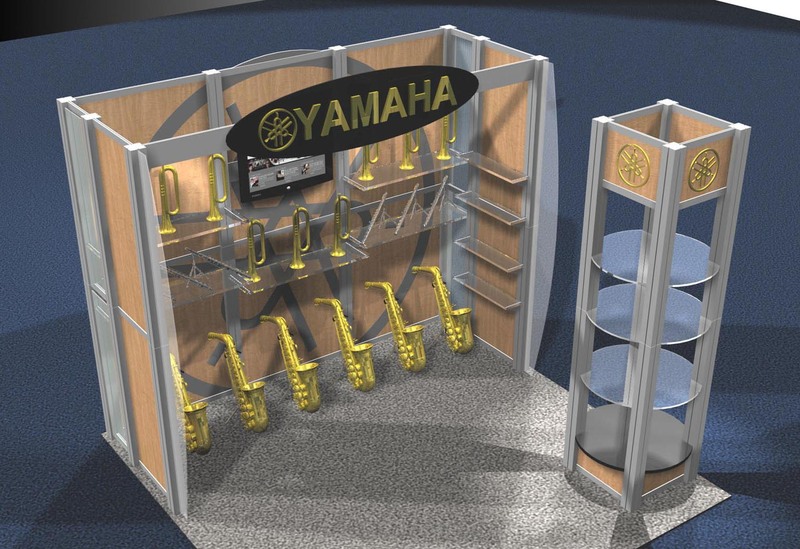 Scroll to see a 10 x 20 version of this display, a picture of the rolling case and an optional kiosk (kiosk sold separately). Scroll to see a 10 x 20 version of this display, a picture of the rolling case.